Temperature Sensors are manufactured by United Electric Controls (UE) in our facility in Watertown, Massachusetts. 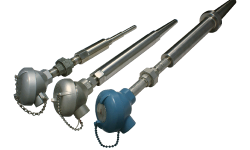 We are a major manufacturer of industrial temperature sensors, thermocouples, resistance temperature sensors (RTD’s), thermistor and other types of sensor assemblies. ISO 9001 certified and a leading practitioner of Lean Manufacturing methods, we focus on building high-quality, high-reliability temperature sensor products for the industrial market. Our expertise covers a wide variety of applications, from lab equipment to road-making equipment, from the blast furnace to the blast chiller, and everything in between. Thermocouples can measure temperatures over wide ranges, fairly inexpensively. They are very rugged, but they are somewhat less accurate vs. RTDs and thermistors. Resistance Temperature Detectors (RTD’s) are stable and have a fairly wide temperature range, but are not as rugged and inexpensive as thermocouples.